Music by : Sundaramurthy K.S. Yamuna is a media baron who runs away to her native village to escape her marriage proposals. There, she starts experiencing weird activities in her home. Seeing this, she makes videos of them and becomes a YouTube sensation. But to her bad luck, things become serious as one of her family members dies in a spooky incident. Who is behind all these incidents? What do they have to do with Airaa? 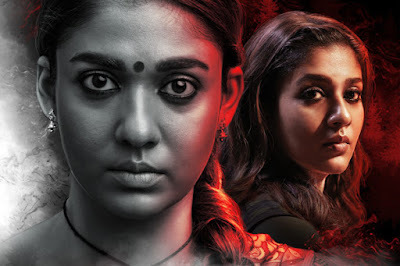 Nayanthara is the heart and soul of the film. She is superb in both her roles but is staggering in the de-glam role of Bhavani. Nayan leads from the front and is drastically different in both the characters and carries the film on her shoulders. Kalaiyarasan, who is featured in this part is good an emotional husband who loses his wife. Special mention should go to the BGM by Sundar Ramurthy which elevates the film nicely. Airaa is slow and dragged out horror thriller which has only a selected few good scenes.